/ How Often Should I Change My Guitar Strings? How Often Should I Change My Guitar Strings? This is a question I hear a lot from beginner guitar players. ​While it's not always a straightforward answer, it doesn't have to be rocket surgery. The issue of changing your strings is also largely dependent on personal preference and how you will be using your guitar. Someone who is playing for an audience may want to change their strings more often (both to avoid a broken string on stage in addition to the better sound quality) than someone who is playing solo a few times a month. ​How Do Strings Wear Out? Guitar strings are under constant tension. Every time they are played the strings vibrate and are slightly fatigued​. Small pits form on the outside of the string as well as microscopic tears within the strings themselves. Every time the string is pulled, these microscopic tears increase slightly. This is one reason you need to re-tune your guitar after any aggressive playing. If the string corrodes due to humidity or sweat from your skin,​ the pits can increase in size, eventually merging with the tears within the string. This is the reason the string will break (usually in front of crowds of people). Unfortunately, this is an unavoidable fact of life. The best defense is to keep your guitar in a humidity- and temperature-controlled environment as much as possible. If your guitar strings are constantly breaking, there are a number of things that you need to look at. Have a look at where the string is breaking to help determine the cause. How Do I Know When To Replace My Strings? 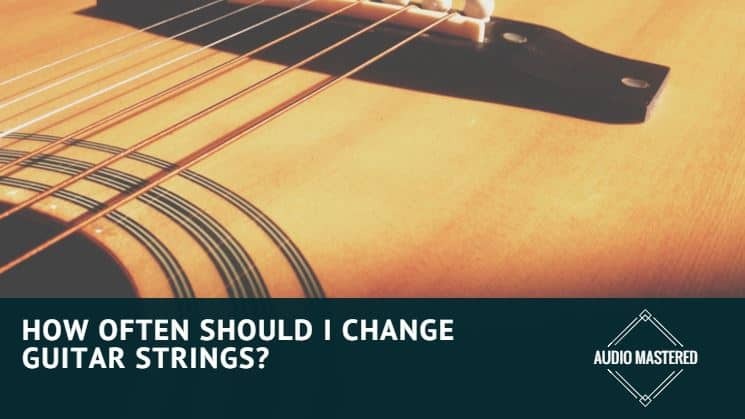 An understanding of how your strings wear out in the first place is a necessary step to gaining an understanding of when to replace your strings. One of the main culprits in wearing down your strings are your own fingers. Sweat, oil, dirt and grime are transferred from your fingertips onto your strings and can build up over time. This is clearly evident when you closely inspect your​ fretboard. See the dark grime building up on your fretboard? This is the same grime that wears down your strings over time. Old strings will usually have a discolored look and lack the same luster as fresh strings. Usually, you'll be able to tell if a string is worn by look, feel, and sound. Do you see any pitting or kinks? 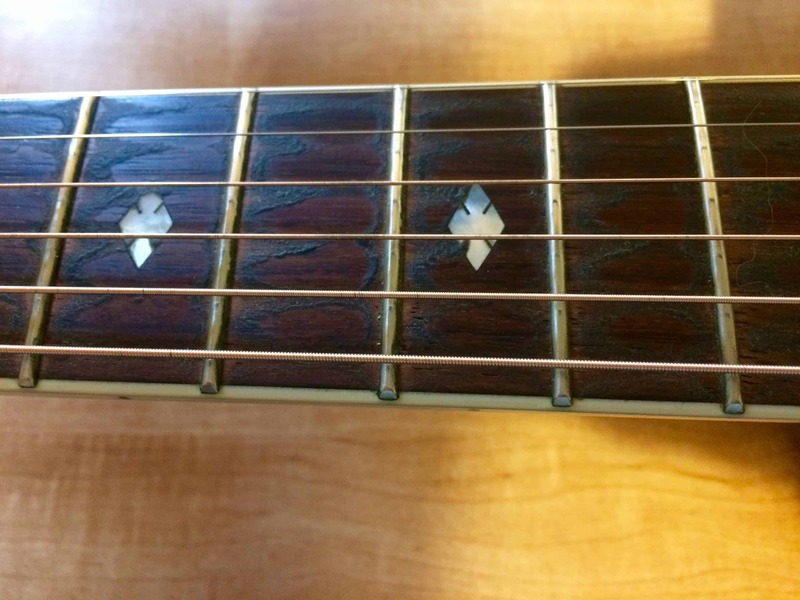 These dark lines are caused by the impact with frets on your fretboard. Do the strings sound dull and flat? Old strings will quickly lose their brightness and shimmer (both visually and acoustically). How often do you need to tune your guitar? Older strings have become stretched and fatigued - thus losing their ability to hold the tension required to remain in tune. You will also be able to feel really worn out strings. With new strings, you will be able to clearly feel the ridges on the string. Older strings have become worn down and end up feeling much smoother. Body chemistry is a leading cause of worn out strings. Pits and kinks are obvious signs of worn out strings. Worn out strings will sound dull and flat. Always out of tune? Time to replace your strings. 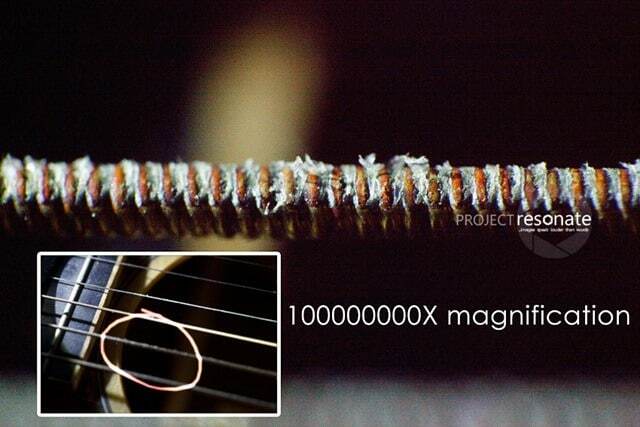 The frequency of your playing is going to have a huge impact on how fast your strings wear out. If you're someone who is playing multiple hours a day, you are going to end up replacing your strings around every 3-4 months or so. If you only play once a week for an hour you will be able to go much longer without having to replace your strings (up to a year or more). Your style of playing is also going to determine the lifetime of your strings. If you are an aggressive player and play your guitar at max volume, your strings are going to take much more of a beating. Bending your strings often? Reduce your lifetime estimate. Use a whammy bar? Same thing. If, however, you are gently strumming you​r guitar alone in your room you can expect your strings to last much longer. This, of course, isn't ​the only factor that determines a string's lifetime. Changes in temperature will cause your string to stretch and loosen repeatedly. This will naturally increase the number of microtears within your strings and eventually cause your string to break as well as require constant tuning. Any humidity changes will not only be hard on the tonewood of your guitar, but can also adversely affect your strings. ​As mentioned above, the combination of corrosion and microtears is what causes your string to fail. Increasing the humidity around your strings will increase the corrosion rate and thus decrease the lifespan of your strings. ​A lack of humidity can also be detrimental to your guitar. Shoot for somewhere around 50% relative humidity (RH). If needed, you can use a humidity control device to maintain a constant RH. If possible, keep your guitar in a temperature-controlled dry environment. Once you know when to replace your strings you will have all the information you need to answer this for yourself. For instance, some professional players will change their strings after every performance. Some amateur players will go years without replacing their strings and some will replace them every month. For those who really need exact numbers, I'll give you some suggested intervals. This, however, is only a loose rule of thumb. It is really going to depend on personal preference. There are a few things you can do to help extend the lifetime of your strings. For starters, wiping off any ​sweat or oil after you are finished playing will reduce any corrosion or grime build up. Some players will even make a habit of washing their hands before they are playing to prevent any unwanted dirt or grime from being transferred to the strings. There are also a few conditioning products available that will cover your strings in a protective coating to help prevent any additional corrosion. Keeping your guitar in a quality case will also help prevent any over exposure to fluctuating heat and humidity levels if you are not able to keep your instrument in a controlled environment. There are also a few strings that come with a p﻿﻿rotective coati﻿﻿ng to help reduce any corrosion. This YouTube video should give you a second opinion on when to change your strings! When you change your strings is going to come down to personal preference. If you love the sound of fresh strings you'll be changing your strings much more often. Whereas some of you will only wait until your first string breaks to replace the set. Interested in other instruments? Be sure to check out our guide on digital pianos for beginners.